Here’s a look at the storm and its impact on Hawaii. 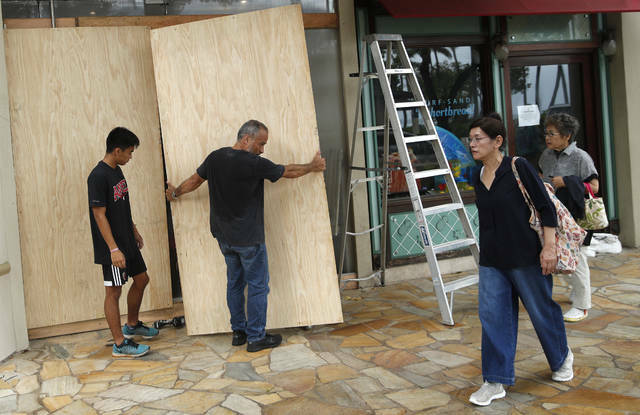 Residents and businesses across the islands prepared for the worst, boarding up windows and stocking up on supplies. 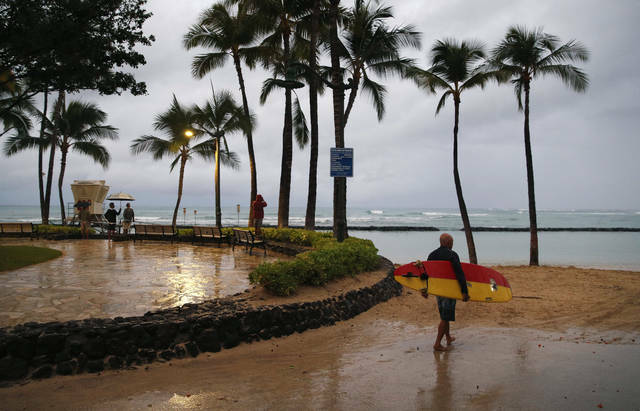 Tourists in hotels along Waikiki Beach in Honolulu didn’t heed warnings to get out of the water. But many visitors stocked up on snack food and beer at convenience stores just in case. The storm moved in the central Pacific along a high-pressure ridge last week, when there wasn’t much wind shear to affect the hurricane. But then the storm began moving north toward Hawaii around the high-pressure ridge, and that’s when its winds died down and it lost speed. The jet stream “just kind of pushed the top off of the hurricane and what happens is it loses exhaust so it just starts collapsing,” Almanza said. Hawaii’s Big Island has had more than its fair share of natural disasters this year, with Kilauea volcano destroying more than 700 homes with lava. If there’s any silver lining, it’s that the lava rock might have helped absorb some of the rainwater better than soil because it’s more porous, Bingaman said. The volcano is still erupting. In fact, it’s been in a continuous state of eruption since 1983, and it opened up several vents beginning in May. It was those vents that sent lava down rural streets, destroying entire neighborhoods as it flowed to the ocean. It’s been a trying few months as Mother Nature — or Pele, the Hawaiian volcano goddess, has set her sights on the Big Island, first with destruction from the volcano to storm damage. 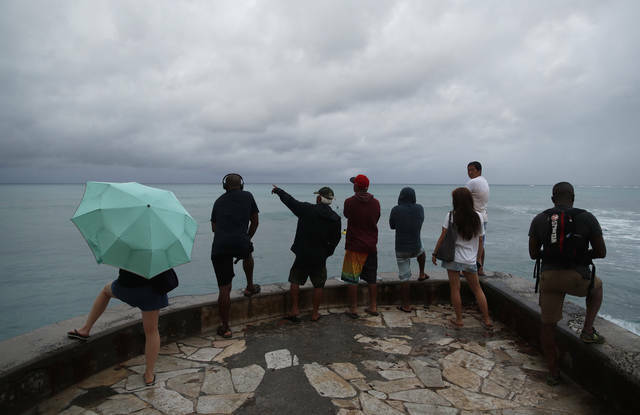 “Definitely we need a break,” Hawaii County Managing Director Will Okabe said, quickly adding that it’s hurricane season and other storms could still develop. “We are going to be prepared, and we always do that well on the Big Island,” he said. It’s not known if the storm played any role in the start of several wildfires near the historical coastal town of Lahaina on Maui. But the high winds early Friday morning certainly helped spread the fire, according to Maui county officials. Junia Howell does not work for, consult, own shares in or receive funding from any company or organization that would benefit from this article, and has disclosed no relevant affiliations beyond their academic appointment. In a new study that I co-authored with James Elliott, a fellow sociologist at Rice University, we found that populations that are privileged in terms of education, race or home ownership gain wealth in the aftermath of natural disasters, exacerbating already wide economic inequities. We then explored how extreme natural disasters influenced changes in family wealth from 1999 to 2013. Throughout our analysis, we controlled for race, education, age, home ownership, family status, residential mobility as well as neighborhood and county demographics with the aim of comparing households that were similar. We also only compared families who started out with similar wealth in 1999. Greater wealth, however, was not experienced by everyone. Using a statistical technique called interactions, we were able to see how these changes affected different segments of the population depending on race, education and home ownership. Finally we focused on home ownership. Similarly, our results showed that those who owned emerged a lot better off than those who rented. Ali Mostafavi does not work for, consult, own shares in or receive funding from any company or organization that would benefit from this article, and has disclosed no relevant affiliations beyond their academic appointment. Americans prepare for natural disasters in many ways, from obtaining flood insurance to identifying evacuation routes. But many people fail to take key steps. I conducted a research survey in Harris County, Texas, which contains much of metro Houston, after the city was flooded by Hurricane Harvey in August 2017, and found a common thread. Few respondents who stayed in place during the storm planned in advance for coping with extended service interruptions, such as road closures, power and water outages and communications interruptions. I am a civil engineer and study interactions between people and infrastructure in disasters. In this survey I wanted to understand how different sub-populations prepare for and adjust to service disruptions during these events. Hurricanes don’t always prompt mandatory evacuations, and even when they do, many people choose not to go. My results show that planning for losing key services, potentially for days or weeks, should be part of preparing to weather storms in place. And cities should keep their most vulnerable residents in mind as they make decisions about storm-proofing critical infrastructure systems, such as power and water. Harvey flooded sewers, closed roads, downed power lines and interrupted telecommunications services across southeast Texas. Unlike tornadoes, which can selectively level one neighborhood and leave another unscathed, hurricanes are perversely egalitarian. In Houston, tony and disadvantaged neighborhoods alike bore the brunt of Harvey. Most residents in hurricane-prone areas know to store food, stock up on water, check their flashlights and radios and plan for evacuations. But I found that relatively few Houstonians were ready for infrastructure service disruptions. Self-reported hardships due to power outages during Harvey. My survey was conducted three month after Harvey and included 750 Harris County residents. They rated sewer, water, electricity and communications as the most important household services, and found sewage backing up into homes from overwhelmed public water systems to be the most onerous disruption. Even households with individual on-site septic systems experienced septic tank overflow due to flooding. Loss of potable water, which affected hygiene, drinking and food preparation, was the next greatest hardship. Electricity and telecommunications outages tied for third place, followed by road closures due to fallen trees, debris and flooding. My students and I found that 53 percent of the people we surveyed were not well prepared for service disruption. Even the 47 percent who had laid in provisions to weather the storm had not thought specifically about service outages. Most people who self-identified as prepared underestimated the extent and length of service disruptions, and many ran out of stored food and water. A whopping 80 percent of households who were without power after the storm had not even considered the possibility of extended outages. Regardless of how well cities harden their infrastructure, service disruptions are inevitable during and after major hurricanes. Once residents accept that fact, they can adopt practical strategies for weathering storms in place. Families that live outside of hurricane paths or flood plains can still experience extended disruptions – for example, if high winds damage power distribution networks, or local roads are blocked by downed trees. It is critical for households to understand the likelihood of service disruptions, assess their basic needs objectively and prepare for possible extended outages. Our research showed that some population groups were especially vulnerable to losing specific services. Households with children 10 and younger self-reported that losing electricity was the most onerous hardship for them, since it made it impossible for them to refrigerate and prepare food. On the other hand, respondents age 65 and older reported that road closures were their greatest burden because they could not drive to work, grocery stores, health care facilities or pharmacies. We also found that low-income residents and racial and ethnic minorities were less prepared overall and experienced greater hardship during post-Harvey service losses. Disaster researchers widely view these groups as vulnerable populations, since they have fewer resources to prepare or adapt to disruptions. Interestingly, we found that seniors over 65 were better prepared to endure sewer, water and telecommunications losses after Harvey. For many of them prior experience with storms had instilled the value of preparation, and on the whole they were ready for the impending storm. Some people choose to shelter in place during disasters because they cannot afford to leave their homes for unknown destinations. Houston is investing in a swath of flood control and flood risk reduction projects. Notably, on Aug. 25 the city adopted a $2.5 billion bond measure to overhaul the region’s flood-protection system.. Protecting homes is important, but cities should also invest in hardening infrastructure systems, such as power and water lines, to support residents who shelter in place during storms. Local communities can handle some of these upgrades. For instance, some Houston neighborhoods lost internet connectivity for as long as six weeks due to submerged utility boxes housing network electronics. This problem could be solved by raising the boxes above potential flood levels. Identifying and hardening infrastructure components, such as power sub-stations and wastewater treatment plants, that are highly vulnerable to future storms is a critical task for utilities and city planners. Also, recognizing and protecting vulnerable sub-populations who are most affected by service outages should be a priority. As households prepare for an storm, consideration of possible power outages, sewer backup, and road closures should factor into their decisions about evacuating or sheltering in place. If they stay, they should not underestimate the likelihood of service disruptions. No one likes to lose power or internet, but imagining the possibility of extended service outages and the resulting hardship can help households prepare and cope with the disruptions. Ph.D. student Amir Esmalian and technical writer Jan Gerston contributed to this article.